This winter, parts of drought-stricken California have been besieged by heavy flooding, mudslides, and feet of snow. The cause? A meteorological phenomenon known as an atmospheric river, which carries high concentrations of water vapor in narrow bands from the warm tropics up to western North America. 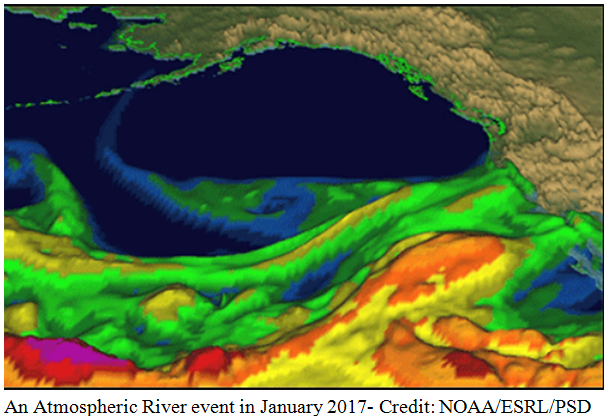 In the western U.S., atmospheric rivers are relatively common and are critical providers of winter rain and snow. However, they can also be a source of extreme flooding and costly damage to transportation networks, public utilities, and other infrastructure. While the economic and social impacts of strong atmospheric rivers are well understood, we know much less about how they can impact ecosystems. (March 7, 2017) - Aerial surveys will begin March 16 and run through mid-May in five states containing lesser prairie-chicken habitat. 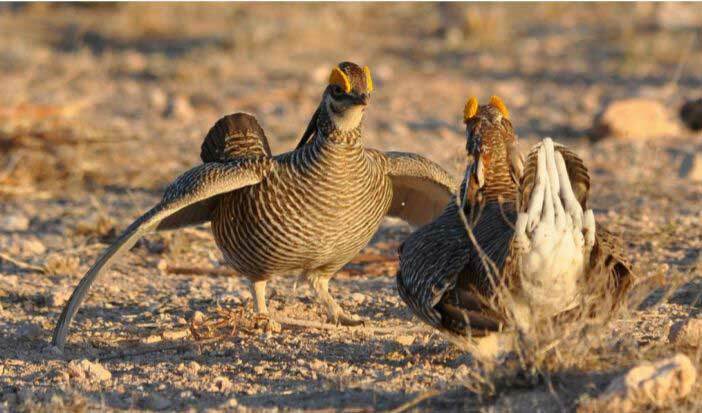 The surveys are conducted annually by the Western Association of Fish and Wildlife Agencies (WAFWA) to document population trends and how the bird is responding to management strategies identified in the Lesser Prairie-Chicken Range-wide Conservation Plan. The range-wide plan is a collaborative effort of WAFWA and the state wildlife agencies of Texas, New Mexico, Oklahoma, Kansas and Colorado. It was developed to ensure conservation of the lesser prairie-chicken with voluntary cooperation of landowners and industry. The plan allows agriculture producers and industry to continue operations while reducing impacts to the bird and its grassland habitat. Washington, D.C. – Today, the Senate passed H.J. Res. 44 (Rep. Liz Cheney, WY-at large), a joint resolution of disapproval under the Congressional Review Act to repeal the Bureau of Land Management’s (BLM) Planning 2.0 rule. “This rule emboldened federal bureaucrats and placed special interests ahead of local communities and states in resource management decisions. I am pleased the Senate followed the House in passing this joint resolution to restore decision making power to the people who actually live in these areas. These communities need more say, not less,” Chairman Rob Bishop (R-UT) stated. Carlsbad, Calif (March 1, 2017) -- A recovery plan to help restore healthy populations of the threatened Santa Ana sucker within its range was released today by the U.S. Fish and Wildlife Service. The plan was developed in collaboration with state, local and federal partners that includes local landowners, California Department of Fish and Wildlife and local water districts. Santa Ana suckers, small freshwater fish, are found in portions of the San Gabriel, Los Angeles and Santa Ana River watersheds in southern California. 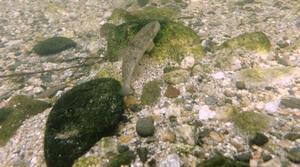 Ensuring conservation of the Santa Ana sucker will not only protect a native California fish, but benefit people and countless other wildlife species by ensuring clean, healthy watersheds in southern California. As a result of loss, alteration, and degradation of its habitat from altered stream hydrology, introduction of nonnative species that prey on the sucker, and operations of dams and installation of barriers that modify its habitat, the Service listed the sucker in 2000 as a threatened species under the Endangered Species Act. Nationally, we are seeing extreme to exceptional (D3 to D4) drought conditions fall to their lowest point in more than 6 years. Nowhere is that change more dramatic than in California. The current (February 21, 2017) Drought Monitor for California notes the disappearance of D3/D4 from California. At the California drought’s peak from August-October 2014, that percentage was nearly 82 percent. As recently as early-December 2016, coverage of D3/D4 in California stood at 43 percent.